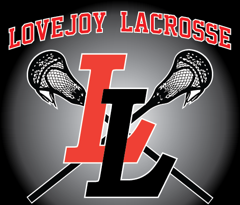 Updated Thursday April 9, 2015 by Leopard Lacrosse. Lacrosse is the fastest growing sport in the United States. Texas is no different. Lacrosse is also the fastest growing sport in North Texas. Lacrosse is a unique combination of speed, skill, agility, grace, teamwork, and finesse. And it is also addictive. It is commonly said that those who take the opportunity to pick up a lacrosse stick will never put it down. Attackman: The attackman’s responsibility is to score goals. The attackman generally restricts his play to the offensive end of the field and are positioned in the opposing goal area. Attackman are typically the best stick handlers. Together with the midfielders (middies), the attackmen work the ball offensively to set up scoring opportunities. Each team should have three attackmen on the field during play. Midfielder (or “Middie”): The midfielder’s responsibility is to cover the entire field, playing both offense and defense. The midfielders are the main ball carriers on the team. The midfielder is a key to the transition game, and is often called upon to clear the ball from defense to offense. Midfielders typically bring the ball up the field into the attack zone to set up offensive plays and scoring opportunities with their attackmen. Each team should have three midfielders on the field. Defenseman: The defenseman’s responsibility is to defend the goal. The defenseman generally restricts his play to the defensive end of the field. They play in the defending goal area around their own goal crease. Defensemen use longer sticks (shafts up to 72 inches) that enable them to better “poke check” the sticks of opposing ball carriers. Defenders constantly check attacking players to prevent them from taking shots on their goal. They also work with their goalie to “clear” the ball from their defensive zone up to the midfielders. Each team should have three defensemen on the field. Goalie: The goalie’s responsibility is to protect the goal and stop the opposing team from scoring. A good goalie also leads the defense by reading the situation and directing the defensemen to react. The goalie plays inside the “goal crease” in front of his team’s goal. He uses a larger headed stick (up to 15 inches wide) to best defend against oncoming shots. He is the only player allowed to touch the ball with his hands, but can only do so when blocking shots inside his goal crease. He may not control the ball with his hands, only with the stick. Each team has one goalie in the goal during play. The object of the game of lacrosse is to shoot the ball into the opponent’s goal. The team scoring the most goals wins. Each team changes sides of the field between periods. Each team is permitted two timeouts each half. The team winning the coin toss chooses the end of the field it wants to defend first. The players take their positions on the field: Four in the defensive clearing area (three (3) Defensemen and a Goalie). One player in the center of the field, two players in the wing areas (all Midfielders). Three (3) in their attack goal area (Attackmen). The lacrosse game begins with a face-off. The ball is placed between the sticks of two squatting players at the center of the field. The official blows the whistle to begin play. Each face-off player tries to control the ball. The players in the wing areas can run after the ball when the whistle sounds. The other players must wait until one player has gained possession of the ball, or the ball has crossed a goal area line, before they can release. 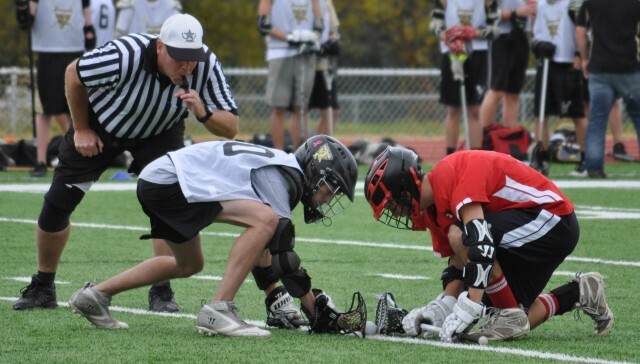 Center face-offs are also used at the start of each quarter and after a goal is scored. Players must use their sticks to pass, catch, and run with the ball. A player may gain possession of the ball by dislodging it from an opponent’s stick with a stick check. A legal stick check is the controlled poking or slapping of the stick and gloved hands of the player in possession of the ball. Body checking is permitted if the opponent has the ball or is within three (3) yards (in Bantam and Junior Division) – and five (5) yards (in High School) – of a loose ball. All body contact must occur from the front or side, above the waist and below the shoulders, and with both hands on the stick. An opponent’s stick may also be stick checked if it is within five yards of a loose ball or ball in the air. Aggressive body checking is discouraged and take-out checks are not allowed and are considered a penalty. If the ball or a player in possession of the ball goes out of bounds, the other team is awarded possession. If the ball goes out of bounds after an unsuccessful shot, the team whose player is nearest to the ball when and where it goes out of bounds is awarded possession.